I am not sure that is Prince Crossing. There is no Sidwell Studio building there. My dad worked there for many years. Beautiful color photo. I hope you are able to scan more, William. Why is it traveling under wire instead of by third rail? I agree with Jonathan than it is not Prince Crossing. Obviously, I have the location incorrect. Prince Crossing is on the Elgin branch and would have been third rail. Since it is under wire and the track appears to be maintained to a lesser level than CA&E mainline rail, I suspect that this photo was taken along a portion of the Batavia Branch. At that time, there were a crossing at Glenwood Park (Rt. 25), Hart Road, Wagner Road, State Road and Bilter Road. 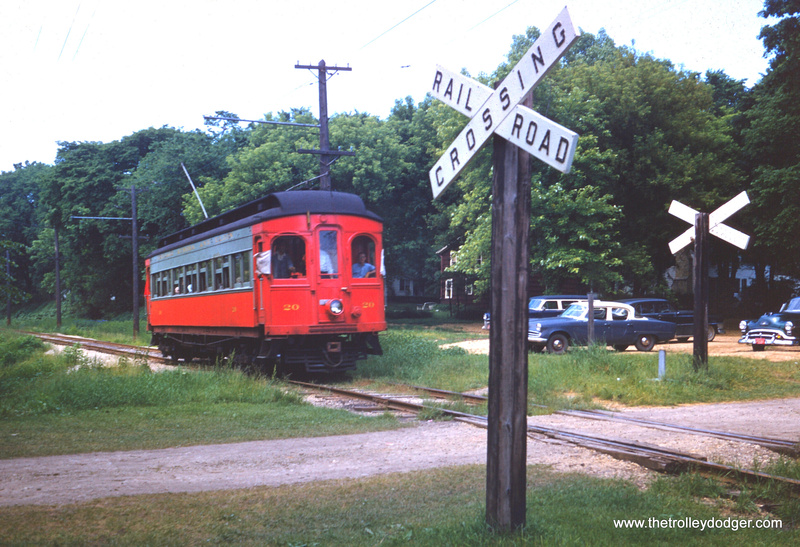 I don’t recall where the wire ended on the Batavia Branch, but the photo may have been taken at one of these locations. It is not Rt. 25 as even in those days, that was a more prominent crossing. My recollection is that this was a rather remote location. I would certainly like to know the exact location. From the previous two posts, I know there was a brief stretch of wire at State Road. You might want to compare this photo with the ones taken there. It is not State Road as there was a single crossing gate there along with crossing lights. There was also a passenger shelter there with a semophore and a signal there to indicate a passenger waiting. There is a 1947 photo of car no. 142 at State Rd. in the softcover book by James D. Johnson, titled Aurora ‘N’ Elgin, published in 1965. That photo shows a two lane road and paved crossing. That photo had me tearing out what is left of my hair. Consensus has it narrowed down to the Batavia branch. It couldn’t be State Road, as it’s a paved state highway with crossing gate protection. The other flag stops mentioned are all in third rail territory. State highway 25 passes over the railroad. The other stretch under wire extends from north of Glenwood Park to the Wilson Street terminal. A Google map of Batavia doesn’t clearly identify a crossing of the current trail. Finally, I located a very similar photo on page 117 of Volume I of the Plachno CA&E series. It is from the Daniel Frizane collection and identified as being “between the power house siding and Batavia station”. Thank you, George. Do you have any way of posting the photo you have in the Plachno series? Maybe photograph it with a smart phone camera. It would be interesting to see another view of the crossing. I have a better explanation: If Chestnut St. in Batavia is projected west to the river, this crossing is just slightly south of there. Hope that helps.